A beautiful species of Gracilaria featuring rigid, flame shaped branches that form a tight symmetrical bush. It is lightly calcified so the addition of calcium is recommended. In shallow water it is often found in very large clumps covered in colonial tunicates or encrusted with epiphytic bryozoans. The coloration varies between deep crimson red to bright orange depending on the amount of light provided. 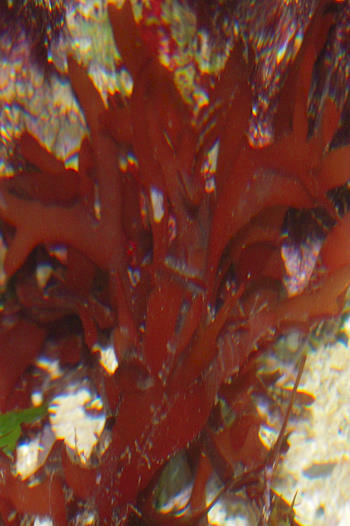 It features a small holdfast that can be attached to rocks or left as a free floating specimen if desired. Overall it is undemanding and will grow well under a variety of conditions even in low flow environments. 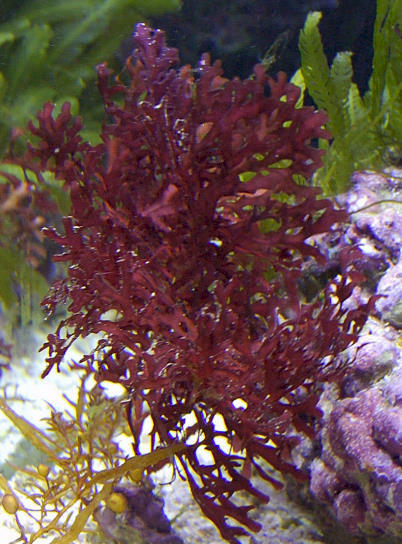 Due to its lightly calcified branches it is not known to be very palatable to fish or invertebrates. Copyright © 2010 GCE All rights reserved. No part of this online publication may be reproduced in any form by any means without the expressed permission of the author. All images are the property of Gulf Coast Ecosystems unless otherwise noted and should not be reproduced or distributed without permission.